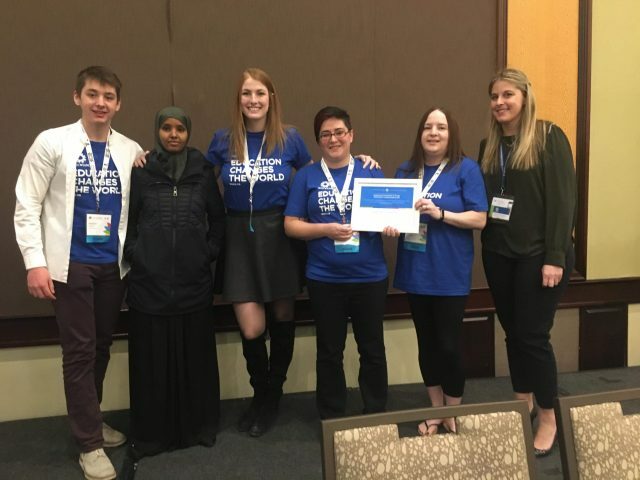 Representatives of the Brandon University WUSC committee (from left to right) Parker Easter, Filsan Abdullahi, Margaret de Jager, Brandy Robertson and Angie Nor Addin are joined by Michelle Manks, the Senior Program Officer for the Student Refugee Program with WUSC-Ottawa at the national Forum. 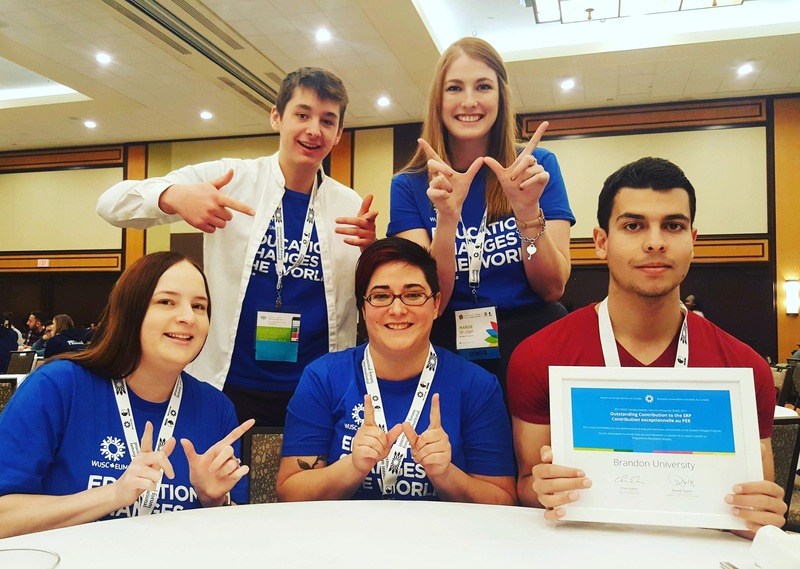 BRANDON – The World University Service of Canada (WUSC) committee at Brandon University (BU) was presented with a national award recently. The BU WUSC Local Committee was recognized for Outstanding Contribution to the Student Refugee Program (SRP) at the national WUSC Forum awards ceremony in Ottawa in late January. The BU WUSC committee was singled out from more than 80 Local Committees for the implementation of its Mentorship Program, which pairs a current BU student with a newly arrived SRP student. Every year about 130 students from refugee camps in Kenya, Malawi, Thailand, Jordan, and Lebanon are sponsored through the SRP to come to Canadian post-secondary institutions. Brandon University has been a part of this legacy for nearly 40 years, typically sponsoring one or two students each year. 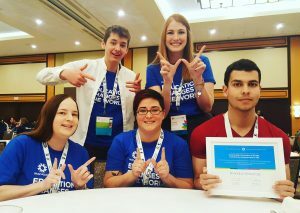 Brandon University WUSC representatives (left to right) Angie Nor Addin, Parker Easter, Brandy Robertson, Magaret de Jager and Ahmad Al Masri show off the award received by the Local Committee at the national WUSC Forum in Ottawa. In 2016, when the humanitarian crisis in Syria occurred, displacing millions of people, WUSC put out a call out for increased student sponsorship specifically to help the relief effort. Brandon University agreed to sponsor a third student, and the generosity of BU alumnus Russell Lusk, BA ’65, brought the sponsorship number up to four for the 2016-17 academic year. Brandy Robertson, a longtime WUSC member and current sessional faculty member for BU’s Department of English and Creative Writing, says addition of more SRP students provided incentive for the development of the Mentorship Program. This led to the establishment of the Mentorship Program. A call went out to the Brandon University student body in mid-August seeking volunteer settlement partners for the newly arrived students. As settlement partners, students commit to spending one to two hours each week for the first academic term with a goal of providing friendship and support to help the new students settle into university life and life in Brandon. “The program has been highly successful,” says Angie Nor Addin, current President of the Staff/Faculty/Alumni WUSC Club on campus. “It was exactly what we needed to ensure that the sponsored students were supported properly in the way that they deserved. For the 2017-18 year, BU is sponsoring three students through the SRP each who have been paired, once again, with a current BU student. Robertson plans to suggest this model of sponsorship support to all Local Committees across the country. For more information on BU’s involvement with WUSC and the SRP contact buwusc@gmail.com.